Infrastructure continues to be on the front burner in Africa's development agenda, experts said as the African Union summit concluded on Monday in the Ethiopian capital, Addis Ababa. The continent will continue to scale up investments in the sector to enable the takeoff of other prioritized programs such as expanding and improving the quality of healthcare, industrialization and increasing productivity in the agricultural sector. The experts were speaking on the sidelines of the summit, whose theme was Refugees, Returnees and Internally Displaced Persons: Toward Durable Solutions to Forced Displacement in Africa. The leaders are expected to come up with solutions for preventing mass displacement of people while also integrating refugees into society. Africa now has 14.7 million internally displaced people and 7.3 million refugees. More than half are under the age of 18. Data indicates that in the first six months of 2018, 2 million people were displaced, mainly from Central African Republic, Nigeria, South Sudan, Democratic Republic of Congo and Somalia. Conflict, poverty and the effects of climate change have been identified as causes behind internal and international displacement of people from their country of origin. Infrastructure is seen as a key way to reduce these challenges. 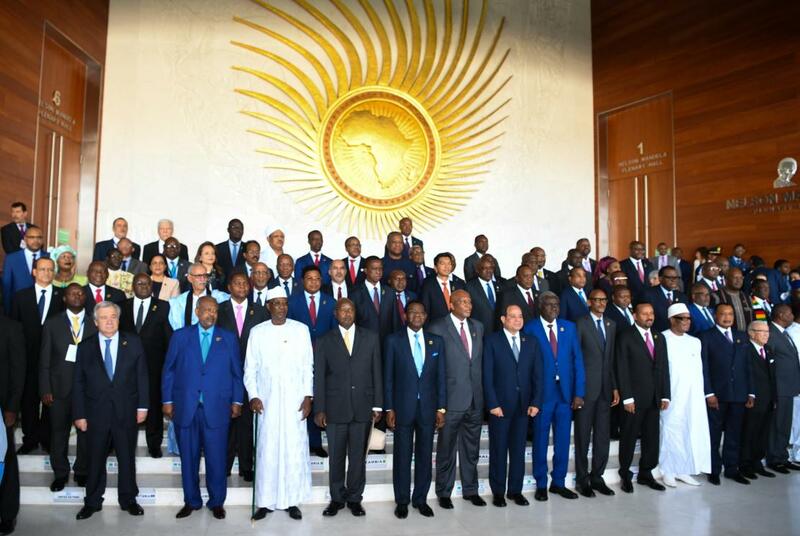 In his congratulatory message to the AU, President Xi Jinping said China is willing to work with Africa to implement the outcomes of last year's Forum on China-Africa Cooperation summit in Beijing, promoting the alignment of the joint construction of the Belt and Road with the implementation of the AU's Agenda 2063, the United Nations' 2030 Sustainable Development Agenda and other development strategies of African countries. His message comes at a time when the AU is undertaking reforms that promise to increase investments in infrastructure. Africa has been looking for alternative financing approaches to push ahead its modernization strategy. On the sidelines of the AU summit, Ibrahim Mayaki, CEO of New Partnership for Africa's Development, announced the renaming of the agency to the African Union Development Agency. The agency will focus on mobilizing resources to fund infrastructure programs that accelerate continental integration. The move aims at supporting Africa's goals of creating a continental free trade area and a single market for air transportation, said Mayaki. "The engagement Africa has with China is of great importance. We are working toward converging priority areas identified under the Belt and Road Initiative with those under the Program for Infrastructure Development in Africa," he said. The BRI and PIDA strongly focus on identifying and financing cross-border infrastructure projects. "We have been focused on building transmission lines across borders to facilitate access to reliable and affordable energy in regional blocs," said Mayaki. He also said the agency is focused on engaging China's private sector. The move would not only offer the continent alternative financing sources but also build platforms to enable desperately needed skill transfer programs. Because of the links between youth unemployment, crime and unsafe migration, a continental free trade area is urgent, he said, and private investments there are crucial. "Investments in health and education and science, technology and industrialization will enable the continent to harness Africa's youth dividend and reduce mass movement of youths to Europe," Mayaki added.